To select a size of a gas control valve, you should calculate the required flow coefficient Cg or Kg for the given flow rate and pressure drop. For a specific gas control valve, the flow coefficient Cg or Kg is determined experimentally by control valve manufacturers, and you can found it in manufacturers technical specifications. They express flow coefficient Cg or Kg as the flow rate of water in g.p.m. [m3/h] for a pressure drop of 1 psi [1 bar] across a flow passage [flow coefficient: Cg-imperial, Kg-metric]. You can calculate the gas control valve capacity for given upstream and downstream pressure and known flow coefficient Cg or Kg. With maximum flow rate calculated, you can compare capacities of control valves from different manufacturers with the same nominal size. Standard EN334 is covering gas control valves and pressure regulators for pressures up to 100 bar. The calculator is in line with the same standard. 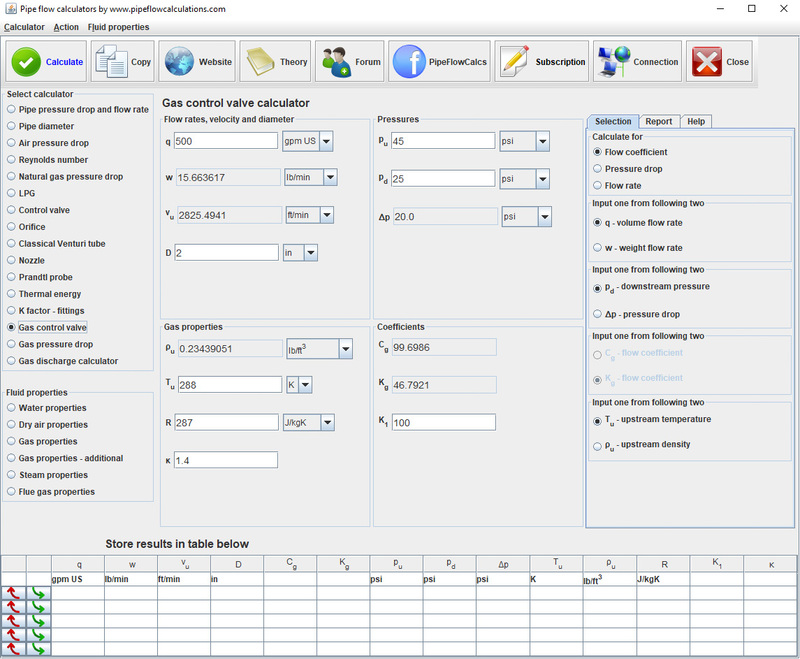 You should use a flow coefficient calculator for an incompressible flow of liquids.